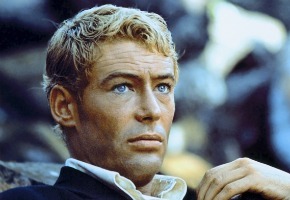 This Sunday TCM channel has a premiere special on Peter O’Toole with an interview by Roger Osborne. The TCM Classic Film Festival 2012 was held in Hollywood in April 2012. In the special, O’Toole keeps the audience enraptured with stories from his life and career. He recalls his earliest memories of going to the movies as a child, an activity usually prefaced by a milkshake. He remembers his earliest movie experience as going to see the Marx Brothers in A Day at the Races (1937) with his father, who was a bookie. He also talks about his first career as a journalist, his stint in the Royal Navy during the Korean War and his decision to become an actor. An idealistic young British officer in WW1, T. E. Lawrence becomes a triumphant leader with unyielding courage, gaining him near god-like status among his Arab brothers.